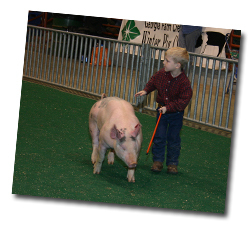 Membership is open to anyone who has an interest in the Georgia Junior Swine Project. Become a GJSB member today! Download Application. Annual Membership dues are $20 per family. Did you know that this year the swine boosters supported our youth in the following ways? 2) Sponsorship of the Reserve Champion gilt at GA Nationals. 3) Sponsorship of the state FFA Swine Proficiency award. 4) Participation in the GA Livestock Catalog program. 5) Leadership opportunities for the Junior Board including the NJSA leadership conference. 6) Premiums for the GA Bred state class winners. 7) Show opportunities and prize money. Designed & Hosted by Joy Carter Photography & Design.